Launched: 14 October 2001. Last updated: 7 March 2015. To Sir Ernest H. Shackleton H.M.G. PARADISE HARBOUR RE-VISITED from Christopher J. Wilson. SOME ANTARCTIC HAIUKU AND TANKA from Christopher J. Wilson. TANKA Tanka consist of five units (often treated as separate lines when romanized or translated) usually with the following pattern of on: 5-7-5-7-7. Jim's book was presented at Athy this year; he gave a very well-done talk on the subject. Shackleton was well known for his love and knowledge of poetry so this book is a welcomed addition to the Shackleton canon. "Sir Ernest Shackleton, known as a tough polar explorer and inspirational leader, also held the words of poets close to his heart. 'Poetry was his other world and he explored it as eagerly as he did the great Antarctic spaces,' said his friend, Mrs. Hope Guthrie. This new biography reveals another side of Shackleton's story through the poetry he loved. It also includesÐfor the first time in published form—all the poems and poetic diary extracts written by the great explorer, each of which sheds light on significant milestones in his life and adventures. Shackleton, who did more than any other explorer to open Antarctica to the popular imagination, used poetry as a tool, to encourage and motivate men who were frequently operating close to their physical and psychological limits. The works of Tennyson, Browning and Robert W. Service were, in his own phrase, 'vital mental medicine' throughout his life. Poems influenced his speeches, his letters to his wife and the way he led his men. These verses, selected from his correspondence and other sources, are linked throughout the book to Shackleton's turbulent and restless life, offering fresh insights into his struggles in the Antarctic, his strained but loving marriage and the magnetic attraction of the polar regions. Shackleton: A life in Poetry is a love story, a new interpretation of a well-known Boy's Own adventure and a poetic exploration. Jim Mayer is an expedition leader and a guide in the Arctic and Antarctic where he specialises in polar history. He has led his own life of exploration, having skied across the Greenland ice cap and survived an attack from hungry polar bears." Source: From the publisher's website. So the furside is the outside, and the skinside is the inside. One side likes the skinside inside, and the furside on the outside. As the skinside is the hard side, and the furside is the soft side. Then the soft side, furside's inside, which some argue is the wrong side. bally thing, someone's sure to tell you it's outside inside. To forfeit ease and urge the human weal. And yield their fragrance but to brave emprise. In governmental halls where laws are made. The varied hues of landscape and of sky. The singer sings his song and passes on. Or strewn their seed along a barren way? His callthe summons of an onward God. Of feasting, or of cushioned ease and rest? Amid the vigils of the awesome year. The silent Hail of every gleaming star. The quest unfinished,ah, 'tis ever sweet! The goal unreached, the best of life ne'er done! 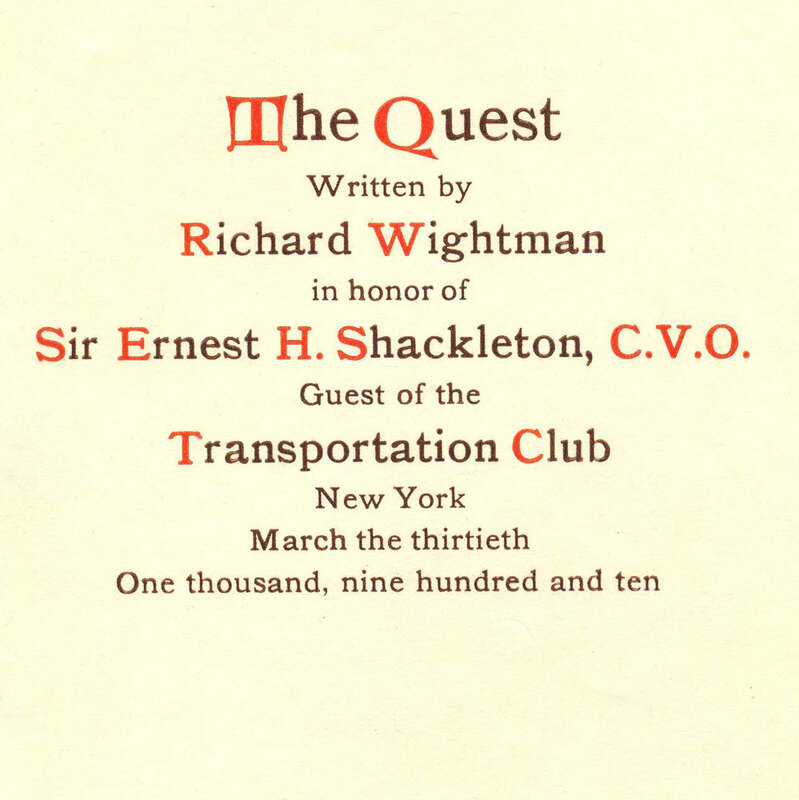 Writ clear in light, the name of Shackleton. Elizabeth Bradfield's Approaching Ice | Poems has been issued by Persea Books (New York, 2009, 102pp, $15 paperback, ISBN: 978-0-89255-355-6). These short poems are both Arctic and Antarctic related. There are a number of reviews of the collection at www.ebradfield.com/pubs.shtml; also several of the poems appear here. To that lone land where bravely you endured. And if perchance you hear the silence calling. The brotherhood of men that know the South. This is quite possibly the worse Antarctic poem ever written though I have to admit I'm not an expert on such things. The number of copies of this pamphlet is extremely limited, and is issued for private circulation only. Reprinted from the Retford Gainsborough and Worksop Times. In June, 1910, the Terra Nova, commanded by Captain Robert Falcon Scott, C.V.O., R.N., and excellently equipped both as to men and provisions, left England on a voyage of exploration to the South Pole. The Expedition arrived at McMurdo Sound, on the shores of Victoria Land, in January, 1911, and there remained throughout the winter. Early in the summer of that year, in November the explorers started from Hut Point over the Great Ice Barrier, setting up snow cairns as guides for the return journey. On December 31st a depot was formed in latitude 86.56, and on January 3rd, 1912, at a distance of 150 miles from the Pole, the supporting parties were sent back. There were left Commander Scott; Captain Edward Grace Oates, of the 6th Inniskilling Dragoons; Dr. Edward Adrian Wilson, zoologist and artist; Lieut. Henry Robertson Bowers, R.I.M., and Petty Officer Edgar Evans. These five set out on the final stage, and on January 17th brought the enterprise to a successful issue, and planted the Union Jack at the South Pole. On the homeward. march they were hampered by head winds, rough ice, blizzards, intense frost, and eventually by a shortage of fuel and food. These difficulties would have been overcome, but sickness occasioned the delay, which proved fatal. Evans accidentally fell and died on February 17th from concussion of the brain. Captain Oates became seriously ill. In view of the impossibility of recovery, and convinced that his illness was retarding the progress of his friends, he walked out into the storm, despite entreaties to remain, and sacrificed his life to save them, Scott, Wilson, and Bowers pushed on. When eleven miles from safety, at "One Ton Camp," with fuel for one hot meal and food for two days," they were confined to their tent for four days; and, with the gale still raging around them, at the close of March, 1912, they succumbed. On November 12th the bodies were recovered—together with the dying message written by the Commanderand were buried on the spot where they were found. When the tidings reached England, in February, 1913, the nation was deeply moved, and a memorial service was held at St. Paul's Cathedral, which was attended by His Majesty the King, Ministers, ecclesiastical dignities, and thousands of the people. Dissolved, unuttered, in the nation's tears. And in the King's dominions far and wide. In "Jesu, Lover of my soul;"
In "Rock of Ages cleft for me;"
In solemn note which rounded all. Beneath the mantle of eternal snows. which flashed in the sun. they swung to The Pole. And turned their footsteps on the homeward track. And ice which cumbered sledge and feet. Though food was short, and fuel too. As black as night, which darkened all. Where comrades laid him in his lonely grave. His work was done, and death was near. And staggered forth to die—the only way. "And for some time maybe." By one last act of chivalry. But fate perverse that saving help denied. And, when eleven miles away, they died. The player exits to eternity. With fortitude and courage passed away. To knowledge strength, to science gain. The daring of his countrymen. And joined his comrades in the Great Unknown. To England's honour and to England's care. And could no more whate'er betide. The fragrant flower of immortal fame. This poem appeared in the Bournemouth Graphic on 14 February 1913. January 18th, 1912. — Captain Scott reached the South Pole. February 17th, 1912. — Petty-Officer Evans died. March 17th 1912. — Captain Oates died. March 29th, 1912. — Captain Scott, Dr. Wilson and Lieutenant Bowers died. To misery in the land of snows. Was the gallant, heroic man's tomb. Those lives, that were so near spent. A few short miles away. With hopes for a brighter dawn. Bowers, Wilson, Oates, Evans and Scott. The following poem has been submitted by Diana Brodie. impatient to leave, reluctant to go home. harbour, somewhere for passing through. No air. All petty scandal. Nothing more. to host, the last no better than the first. in silence and in prayer under a blazing midnight sky. to Kathleen, marked To my widow, by his side. but in 1915 was all used up for armaments. to travel south again to finish it but never did. Kathleen: The happiest woman alive. The ships aloft; or snap the straining mast. A point to mark the ending of the way. Wert though the star that stood o'er Bethlehem? 'Study the treasures under the Antarctic and make use of them even after death.'" From Antarctic, The Journal of the New Zealand Antarctic Society, vol 20, no 1 & 2, 2002, p.23. This Shackleton poem I came upon recently. It appeared in the May 1910 issue of 'Lippincott's Monthly Magazine' (Vol 85, Page 627). Does anyone recognize the poem or know who H. M. G. might be? "I shall take the adventure that God will ordain me." Kindling the fancy, dazzling to the sight. You and your comrades clutched from icy Death. . . . Your jocund hands are strewing o'er the earth! Therefore your laurels blossomed from the snow! Ever upon his knees a man is crowned. Our wistful voices give each other hail. . . .
Alone, the Great Ice Barrier we scale. The penguin is an awkward bird. At least, that's what I've always heard. When other birds act otherwise. And that, I think, is hardly normal. Which doesn't sound so very neat. To raise a child without a nest. Living on a slab of ice. This poem was written by the father of Kim Cunningham of Hancock, New Hampshire. An artist, she has produced an illustrated booklet that includes this poem. Included here with her permission. Barnett, Snowden. Last Entry; being a Romance of Antarctic and Captain R. F. Scott, RN, CVO (London: Oriel Press, Ltd., 1982) 56pp. Wrappers. Foreword by Sir Peter Scott. Illustrations by Joby Jones. £4. ISBN: 0 85362 194 2. Presumably out-of-print. There was also a leather-bound limited edition. Bennet, Mary. Antarctica; a collection of verse on the maiden voyage of m.v. 'R.S.A.' (Durban: Printed by the Know Printing Co, (Pty.) Ltd., )  pp. Wrappers. A collection of eleven poems. Light verse. Gordon, C. Huntly. Scott's Last Expedition in Verse (New Zealand: Whitcombe & Tombs Ltd., )  pp. Wrappers. A not-often-seen poem that I encountered at the 2001 Boston Book Fair. Manhire, Bill. Kim Griggs--a New Zealand journalist who has been to the Antarctic via the NZ Antarctic Programme--passes on the following: "I'd just like to suggest a New Zealand poet for inclusion in the poetry area. New Zealand poet Bill Manhire went to Antarctica as an inaugural Antarctic Arts Fellow. His recently published book of collected poems contains all his Antarctic poems." Doing a websearch this is what I found: Collected Poems by Bill Manhire. Manchester, UK: Carcanet Press Limited, 2001? 220 pp. Paperback £12.95. ISBN: 1 85754 537 0. Available in NZ/Australia from Victoria University Press (presumably the publisher with Carcanet handling areas outside NZ/Antarctica). From the Carcanet website: "Into the settled poetry of New Zealand a disruptive force rumbled in magazines and then burst forth with Malady (1970). Here began the revolution of Bill Manhire. He starts thriftily, with imagistic poems whose calm voices are at odds with the ego-rant of neo-romantic contemporaries. Manhire is drawn to economy, to sparsely-peopled landscapes, the territory of the Norse Sagas (in which he invests serious scholarship) and Antarctica. He sent his publisher a postcard from Antarctica, where he was poet in residence: he was making his first day trip to the South Pole. He generally keeps to stanzas and syntax, but his syntax twists like an Ashberian Möbius strip. As a scholar he is old-fashioned and wants to communicate, making fun of the dialects of literary criticism and theory; he is also an explorer in language who doesn't like to go back to the museum every day but to work in the field. In the briefest moment he establishes his theme (rhythmic, imagistic, syntactical) and immediately starts playing variations. 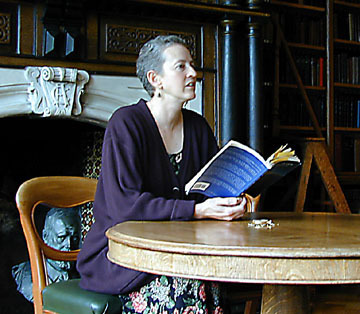 Collected Poems draws on eight previous books. BILL MANHIRE was born in Invercargill in 1946. He was his country's inaugural Poet Laureate and has won the New Zealand Book Award for Poetry four times. He holds a personal chair at the Victoria University of Wellington, where he directs the celebrated creative writing programme and the International Institute of Modern Letters. His volume of short fiction South Pacific was published by Carcanet in 1994." NOTE: Melinda recently read some of her poem at Shackleton's old school, Dulwich College (see photo above). This is a collection of poems, the final one--of three pages--being entitled "To An Antarctic Traveller." Stewart, Douglas. Worsley Enchanted From 'Sun Orchards' (1952), appearing in 'Collected Poems 1936-1967' (Sydney: Angus & Robertson, 1967). Privately re-issued in an edition of 20 copies by the Erebus & Terror Press, 1999, pp. 1. His voyage begins with a dream which, "because sailors are superstitious men", sends him to New Burlington Street, where he finds the office of the Imperial Trans-Antarctic Expedition, 1914. 2. He travels into the country of his dream. 3. He meditates on the nine Emperor penguins which, on the day the Endurance was destroyed by the pack-ice, appeared from a crack in the ice and uttered wailing cries, "quite unlike any we had heard before", that sounded like a dirge for the ship. 4. He watches the men on Elephant Island after their six months' drift on an ice-floe. 5. He hears Crean singing at the tiller of the James Caird, when, with the singer, Shackleton, and three other men, he is voyaging in the ship's boat to South Georgia to bring help to the men on Elephant Island. 6. He hears, as the sixteen days' voyage progresses, the undersong of that "flat, dreary but somehow heartening tune". 8. He looks at a sick man. 9. They find and lose South Georgia. 10. Worsley in the hurricane. 11. He hears the sick man. 12. He sees the end of the boat journey. 14. Worsley, with Shackleton and Crean, the sick men left in King Haakon Sound, climbs the mountains of South Georgia to cross to the whaling station at Stromness Bay. 15. They have the impression that a fourth man is travelling with them. 16. Crean and Worsley fall into the sleep of exhaustion. 17. Out of the waterfall at Stromness Bay. Wainwright, J.A. Flight of the Falcon: Scott's Journey to the South Pole 1910-1912 (Oakville, Ontario: Mosaic Press, ). 151pp. Wrappers. ISBN: 0 88962 355 4. "On January 18, 1912, Captain Robert Falcon Scott and four companions--Wilson, Bowers, Oates, and Evans--reached the South Pole. They had walked for seventy-nine days and almost nine hundred miles only to discover that the Norwegian explorer Roald Amundsen had arrived and departed five weeks previously, Scott and the others turned abound and began the trek home to base camp. Evans died at the foot of the Beardmore Glacier on February 18, Oates walked out of the tent into a blizzard on March 16, and Wilson, Bowers and Scott died in their sleeping bags during the last week of March. Scott kept a diary record throughout the entire journey. Flight of the Falcon counterpoints selections from Scott's diary by providing Scott with a voice not bound by the expectations of his Edwardian audience. Poems mark the poet's own progress on the journey and especially his relationship with Scott, while the commentary of an historian reveals yet another point of view. Photographs and a map accompany the texts. J.A. Wainwright was born in Toronto in 1946 and now lives in Halifax where he teaches English Literature at Dalhousie University. He is the author of Moving Outward (1970), The Requiem Journals (1976), and After the War (1981)."